RCT results in increased oxygen delivery to the tissues by enhanced systemic oxygen transport via hemoglobin in red blood cells (RBCs) and in cases of acute blood loss, by the replenishment of low circulating blood volume. Neonatal RBC transfusion is not without risks. It can be life-threatening in case of transfusion reactions and errors of cross-matching. In the Serious Hazards of Transfusion Report 2016, the incidence of an adverse outcome of RBC transfusion was estimated to be 14.6/10,000 components in the UK in 2016, with a mortality due to blood transfusion estimated to be 1.05/100000 components. Blood transfusion also carries the risk of transmitting infections such as HIV, hepatitis, CMV, and other newly identified organisms such as Trypanosoma cruzi, West Nile virus, Plasmodium spp., and parvovirus B19. Hence, this study was done to find the incidence of RCTs in neonates born less than or at 32+0 weeks of gestation and to establish whether requirement of blood transfusions could be further decreased. This retrospective study was done in the NICU of Fortis La Femme, GK-II, New Delhi. All intramural neonates born less than or at 32+0 weeks of gestation who were admitted and discharged between February 1st, 2017, and January 31st, 2018, from the NICU of Fortis La Femme, GK-II were included in the study. Gestational age was calculated by the 1st day of last menstrual period (LMP). In cases where LMP was not available, gestation was calculated by the estimated age indicated in the first antenatal ultrasonography scan. Babies born with significant congenital or genetic anomalies were excluded from this study. Records of babies were studied retrospectively, and the data obtained were analyzed by Statistical software IBM SPSS Statistics for Windows, Version 21.0 (IBM Corp., Armonk, NY, USA). Chi-square test was applied to check for significance between categorical variables. Pearson's correlation coefficient was calculated for continuous variables. P < 0.05 was considered statistically significant. Fifty-six neonates were found to be born less than or at 32+0 weeks of gestation. Eight neonates died during their NICU stay, four neonates were discharged against medical advice, and one neonate had multiple congenital anomaly and was excluded from the study. Of the 43 neonates included in the study, 16 (37.2%) were female and 27 (62.8%) were male. The mean ± standard deviation (SD) gestation of the neonates was 29.49 ± 2.35 weeks (range: 7+6 weeks; maximum: 32+0 weeks and minimum: 24+1 weeks). The mean ± SD birth weight of the neonates was 1234.93 ± 368.737 grams (range: 1416 grams; maximum: 2060 grams and minimum: 644 grams). It was observed that 17 (39.5%) neonates required RCT during their hospital stay [Figure 1]. 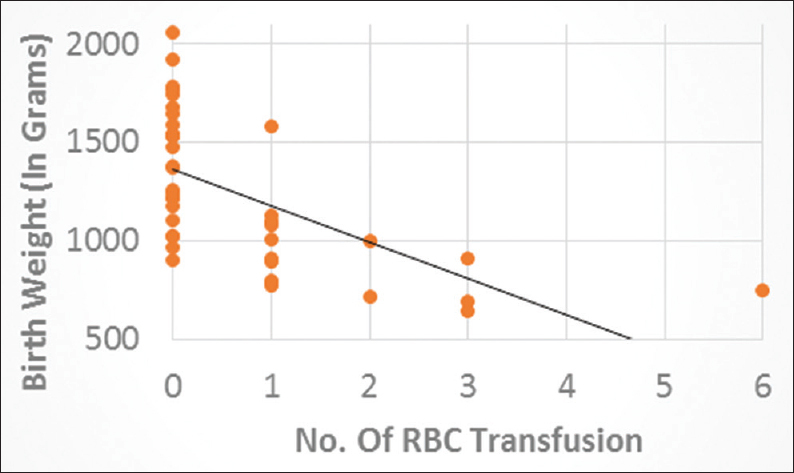 Of these 17 neonates, 11 (64.7%) required RBC transfusion once, 2 (11.7%) required twice, 3 (17.6%) required thrice, and only 1 (5.8%) required six RBC transfusions. 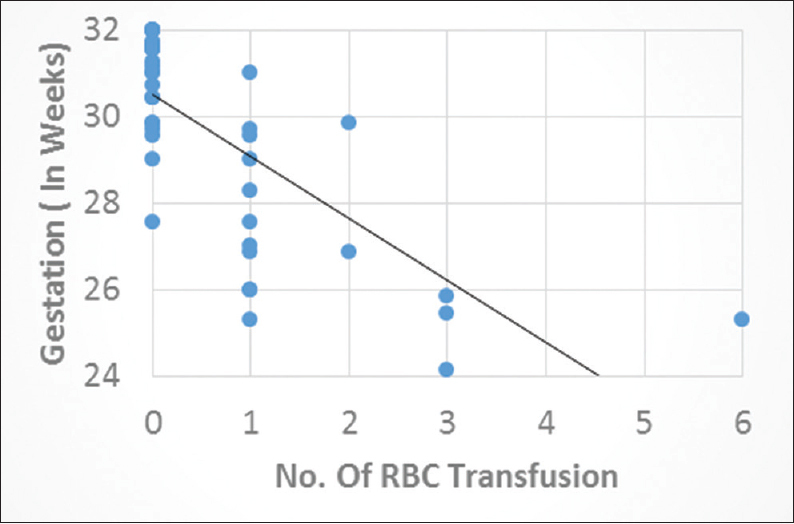 The number of RBC transfusion which the neonates required strongly correlated with gestational age (Pearson's correlation coefficient: −0.732; P = 0.00) [Figure 2] and moderately correlated with birth weight (Pearson's correlation coefficient: −0.602; P = 0.00) [Figure 3]. On analysis, it was found that a significant number of neonates who received surfactant (14 of 18 neonates, P < 0.005), total parenteral nutrition (16 of 20 neonates, P < 0.005), and mechanical ventilation (12 of 14 neonates, P < 0.005) required RBC transfusion [Figure 4]. The number of days on ventilation strongly correlated to the number of RBC transfusions received (Pearson's correlation coefficient: +0.816; P = 0.00) [Figure 5] and the number of days on continuous positive airway pressure (CPAP) showed moderate correlation with the number of RBC transfusion received (Pearson's correlation coefficient: +0.657; P = 0.00) [Figure 6]. 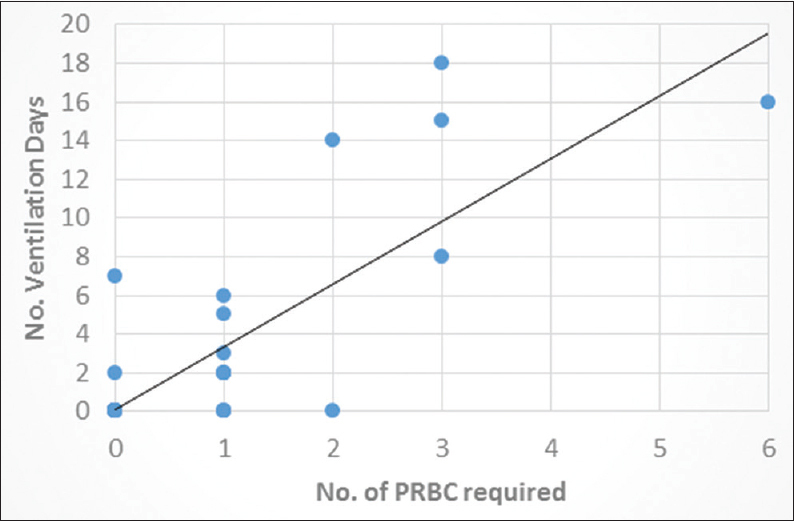 It was observed that 50% neonates with sepsis required packed RBC (PRBC) transfusion as compared with 33% without sepsis (P = 0.008) during their hospital stay [Figure 7]. This study has shown that 60% of the neonates born less than or at 32+0 weeks can be managed without the need of RBC transfusion. Higher gestation and birthweight were associated with less RBC transfusion. 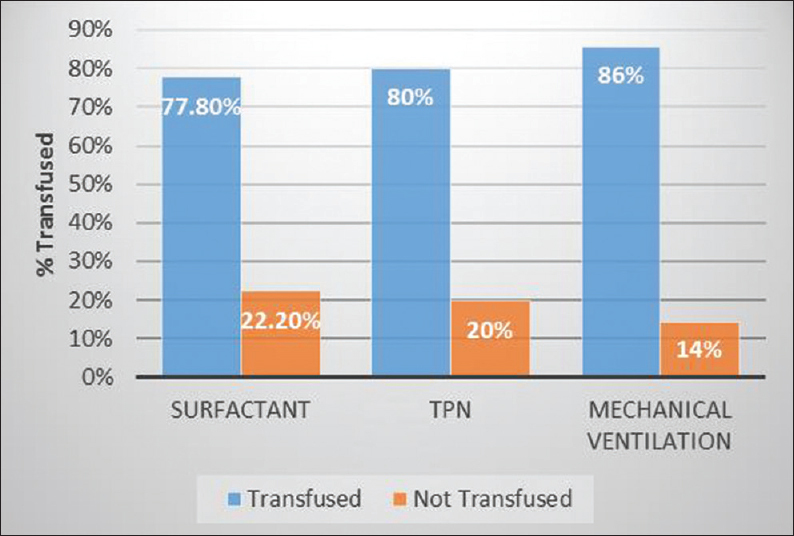 This study found that requirement of blood transfusion was significantly higher in neonates who required surfactant and mechanical ventilation. The requirement of RBC transfusion in these neonates can hence be reduced if we reduce the incidence of surfactant requirement and mechanical ventilation requirement. A Cochrane study of 2017 showed that antenatal steroids reduced the incidence of respiratory distress and need for mechanical ventilation. Hence, antenatal steroids may also help in reducing neonatal RBC transfusion. However, this requires further research. This study also strongly correlated the number of RBC transfusion to the number of ventilation days and moderately to the number of CPAP days. A reduction in the number of ventilation days can be again achieved by the use of antenatal steroids. Increased ventilation and CPAP days also lead to a greater number of blood investigations such as blood gas monitoring leading to iatrogenic anemia. This can, however, be reduced by judicious use of blood investigation, clubbing of blood test to be done, reconsider routine or weekly test before phlebotomy, and use of microsampling devices and point of care investigation such as capillary blood gas. Our study also found that neonates who received total parental nutrition had a higher requirement of RBC transfusion. This can be attributed to reduced delivery of iron to the neonate whose iron stores are already low. Earlier initiation of enteral feeds with early iron supplementation reduced the incidence of iron deficiency anemia and improves ferritin levels and thereby avert RBC transfusion. Our study also showed that sepsis was associated with increased RBC transfusion. Sepsis can be prevented to an extent by following proper hand hygiene, use of asepsis techniques for all procedures and handling of the neonate and judicious use and early removal of venous/arterial lines and other various catheters. 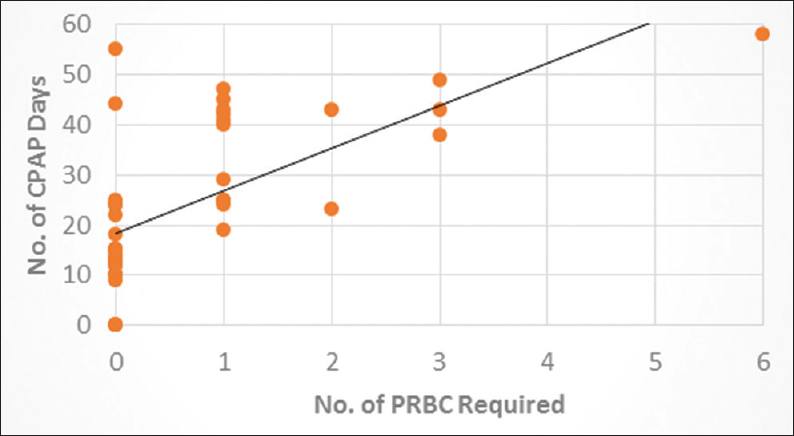 Various studies including the PINT study have demonstrated that a liberal transfusion threshold imparted no benefit to the neonate; however, it exposed the neonate to multiple donors and increased the risk of transfusion reactions and blood-borne infections.,,, We transfused PRBCs at 10 ml/kg as per the guidelines laid down by the National Neonatology Forum of India. 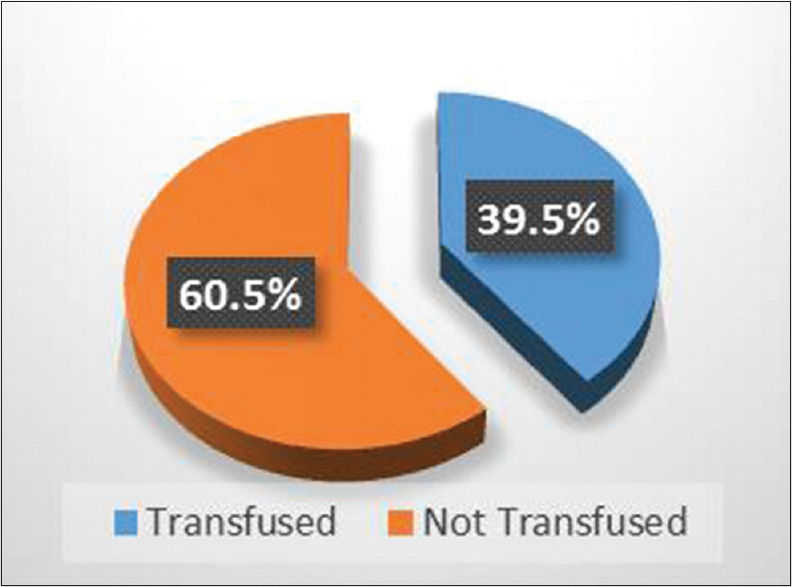 A restrictive transfusion policy helps reduce the number of RBC transfusion required. Many other strategies have been advocated to reduce the requirement of blood transfusions which include delayed cord clamping and cord milking., However, this requires coordination with the obstetric team and cannot always be performed in premature who may require resuscitation. Sixty percent neonates born less than or at 32+0 weeks of gestation are discharged without the need of blood transfusion. A restrictive blood transfusion policy, judicious use of blood investigation, use of microsampling and point of care investigations such as capillary blood gas, early initiation of enteral feeds and iron supplementation, prevention of sepsis, judicious use of venous/arterial lines and noninvasive management protocols has helped reduce blood transfusion in preterm neonates. Antenatal steroids may be beneficial; however, further research is required in the field. Ohls RK. Transfusions in the preterm infant. NeoReviews 2007;8:e377-86. Strauss RG. Red blood cell transfusion practices in the neonate. Clin Perinatol 1995;22:641-55. Widness JA. Pathophysiology of anemia during the neonatal period, including anemia of prematurity. Neoreviews 2008;9:e520. Bolton-Maggs PH. 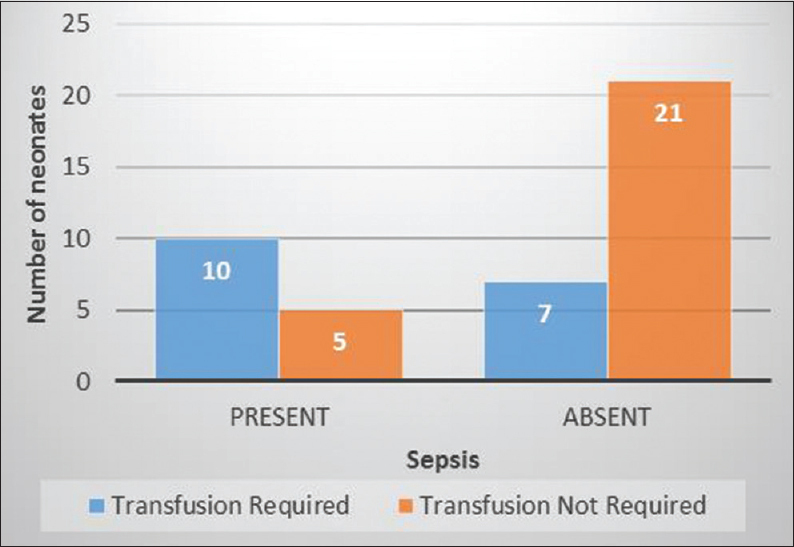 SHOT conference report 2016: Serious hazards of transfusion–Human factors continue to cause most transfusion-related incidents. Transfus Med 2016;26:401-5. La Gamma EF, Blau J. Transfusion-related acute gut injury: Feeding, flora, flow, and barrier defense. Semin Perinatol 2012;36:294-305. Baer VL, Lambert DK, Henry E, Snow GL, Christensen RD. Red blood cell transfusion of preterm neonates with a grade 1 intraventricular hemorrhage is associated with extension to a grade 3 or 4 hemorrhage. Transfusion 2011;51:1933-9. Mikaniki E, Mikaniki M, Shirzadian AH. Effects of blood transfusion on retinopathy of prematurity. In: Blood Transfusion in Clinical Practice. Kochhar PK, editor. InTech, Vienna, Austria; 2012. Available from: https://www.intechopen.com/download/pdf/32727. [Last accessed on 2018 Dec 12]. dos Santos AM, Guinsburg R, de Almeida MF, Procianoy RS, Leone CR, Marba ST, et al. Red blood cell transfusions are independently associated with intra-hospital mortality in very low birth weight preterm infants. J Pediatr 2011;159:371-60. Roberts D, Brown J, Medley N, Dalziel SR. Antenatal corticosteroids for accelerating fetal lung maturation for women at risk of preterm birth. Cochrane Database Syst Rev 2017;3:CD004454. doi: 10.1002/14651858.CD004454.pub3. Meneguel JF, Guinsburg R, Miyoshi MH, de Araujo Peres C, Russo RH, Kopelman BI, et al. Antenatal treatment with corticosteroids for preterm neonates: Impact on the incidence of respiratory distress syndrome and intra-hospital mortality. Sao Paulo Med J 2003;121:45-52. Lemyre B, Sample M, Lacaze-Masmonteil T; Canadian Paediatric Society, Fetus and Newborn Committee. Minimizing blood loss and the need for transfusions in very premature infants. Paediatr Child Health 2015;20:451-62. Whyte R, Kirpalani H. Low versus high haemoglobin concentration threshold for blood transfusion for preventing morbidity and mortality in very low birth weight infants. Cochrane Database Syst Rev 2011;(11):CD000512. doi: 10.1002/14651858.CD000512.pub2. Kirpalani H, Whyte RK, Andersen C, Asztalos EV, Heddle N, Blajchman MA, et al. The premature infants in need of transfusion (PINT) study: A randomized, controlled trial of a restrictive (low) versus liberal (high) transfusion threshold for extremely low birth weight infants. J Pediatr 2006;149:301-7. Ibrahim M, Ho SK, Yeo CL. Restrictive versus liberal red blood cell transfusion thresholds in very low birth weight infants: A systematic review and meta-analysis. J Paediatr Child Health 2014;50:122-30. Whyte RK, Kirpalani H, Asztalos EV, Andersen C, Blajchman M, Heddle N, et al. Neurodevelopmental outcome of extremely low birth weight infants randomly assigned to restrictive or liberal hemoglobin thresholds for blood transfusion. Pediatrics 2009;123:207-13. Saili A, Holla RG, Kumar SS. National Neonatology Forum's Evidence Based Clinical Practice Guidelines 2010. Use of Blood Components in the Newborn. (NNF India, Guidelines); 2010. p. 129-38.